Home » Accessories » QI Wireless charging pad from CHOETECH is perfect for Christmas! QI Wireless charging pad from CHOETECH is perfect for Christmas! Many people are looking at wireless charging alternative and they’ve been around now for a few years. While not widely adopted beyond Samsung and some other OEM’s, smartwatches also benefit from this method of charging VS connecting to a port. 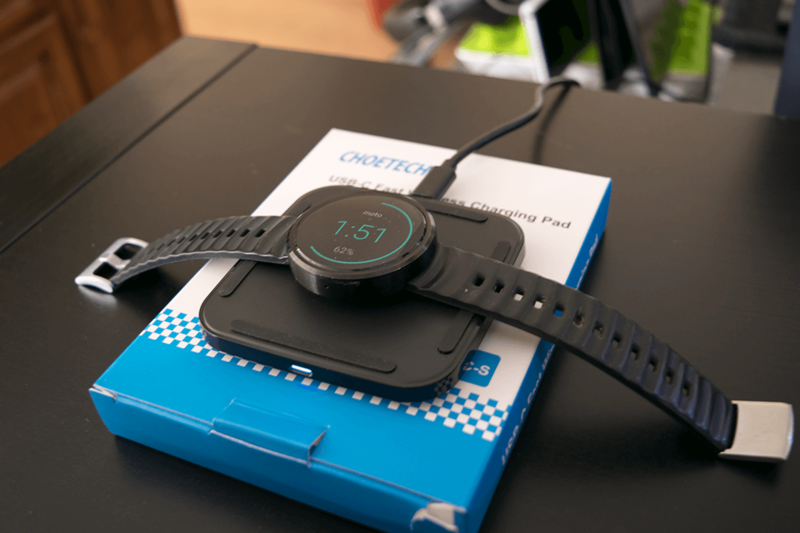 CHOETECH has been in the business of making high-end products just like this wireless charging pad which uses QI technology to achieve it’s wireless energy transfer. Although not entirely new, this can be quite convenient for people that are interested in such accessories. This specific QI charger allows for up to 1.4X fast charging on devices that permit it. Making it one of the fastest wireless charging methods on the market all the while using the latest in USB C connection. You have two types of indicator which will let you know the speed at which you are powering your device; Dim green offers fast charging while the Blue light charges at the standard rate. The difference is pretty simple. while fast charging uses 10W of power the standard mode only reaches a max of 5Watt. This allows for a device like the S7 to use the optimum of the two on its own. In this instance, I’m using my wireless charging pad for my Moto 360 as depicted in the picture above. Currently, Amazon Canada has this specific pad on sale for $23,99 + shipping. Which makes it one of the most affordable models. Sure, you can always head over to eBay and get something cheap and then think you’ve got a good deal, however, you have no guarantee that what you’ll be getting is the real deal. While with CHOETECH you can be sure they’ll honour their warranty.